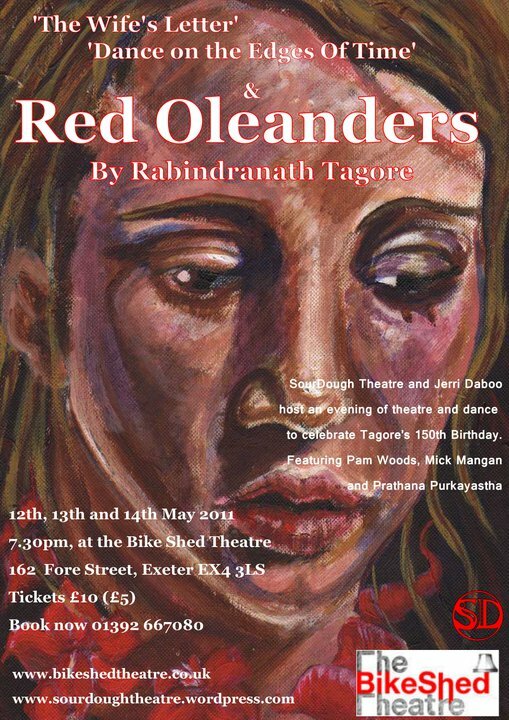 A play by the so-called ‘Indian Shakespeare’ Rabindranath Tagore (1861-1941), Red Oleanders is a poetical drama about a city, Yakshapuri, where everyone has become obsessed with work and wealth till a woman called Nadini arrives and tries to start a revolution against the soulless way of life. The city is technically ruled by a king who is thought of as a god and kept behind a screen at all times, but real power lies with the oppressive governor and political elite. In a translation by Dr Jerri Daboo there was much parallel drawn between these characters and the languages of today’s political elite, and the ethos of the current UK government. For this performance we collaborated with Dr Jerri Daboo who directed the piece. 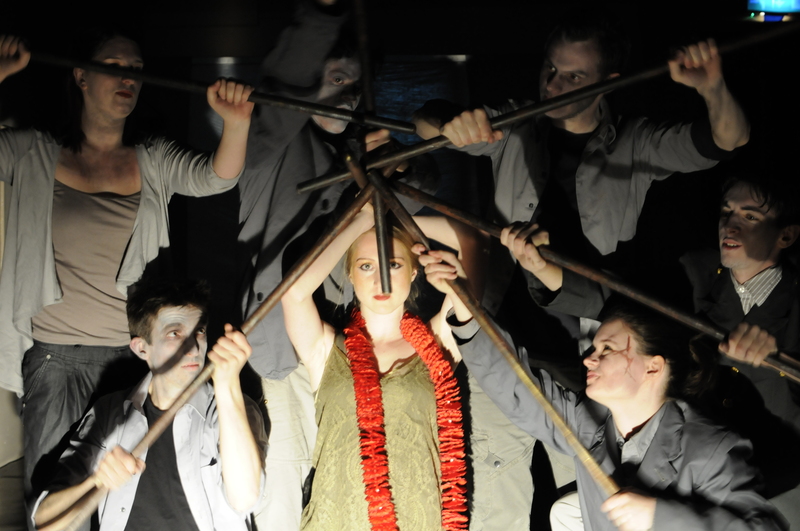 While much of the play rests upon its language, and relevance to today’s world, there were more theatrical moments of choral speaking and figurative sets made with sticks. During the play the king is always at the back, frozen in a grand seated position and silhouetted behind a plastic screen. The aesthetic of the play was a departure from our normal stylings with bright lights, grey workman costumes and an atmosphere of flatness and metal; contrasting with the gold-tinged Nadini and her garland of red flowers. In commendation of Tagore’s 150th birthday Dartington Hall held a festival in his honour with displays of his artwork, speeches about his writing and our performance as a celebratory centrepiece; before we went on to perform in Exeter along with two other dance acts who drew inspiration from Tagore.